Km4City solutions, tools and models are in use for the Sii-Mobility SCN, for RESOLUTE H2020, REPLICATE H2020 and GHOST MIUR projects. Those projects are also contributing in improving the platform and reshare the contribution to the community. Km4City is a knowledge base and a research line of DISIT lab mainly developed before the start of Sii-Mobility, RESOLUTE, REPLICATE projects, but improved w ith them as described in the following. Km4City started in the 2013 with a generic name, smart city ontology, it was named Km4City later. The major information and model at that time was focussed on the Open Data of Florence Municipality and exploiting Lamma for weather, and POI plus street maps from Tuscany Region. Main informative data set were: digital location, cultural activities, schools, commercial activities, etc. RESOLUTE H2020 started in the 1st of May 2015. It planned to use Km4City since the project proposal with the aim of exploiting the Km4City solution and imrpving it. The activity focused on resilience guidelines and of transport systems. Issues very relevant have been the monitoring of people flows moving in the city, the monitoring of risk, the FRAM model and tool (as Resilience DS), the access and integration of knowledge and data regarding the risk and resilience assessment. Among them: Wifi data for modeling and traking people flows i nthe city, emergency data from hospitals, hearthquack data, risk maps on floding and value building for real time assessment, etc., integration of Smart Decision Support based on System Thinking, etc. RESOLUTE project is developing several other tools with the help of other partners and industries which are not developed yet and are not included into Km4City view. Sii-Mobility SCN MIUR started the 1st January 2016. It is the major contributor to the enlargement and improvement of Km4City being contributed with mobilty and transport issues at level of Tuscany since Sii-Mobility has among its goals a large experimentation in many city of Tuscany. Thematic areas are mainly: local transportation, parking, metro, train, traffic flow data and predictions, gates, routing, user engagment rules, user behavior analysis for mobility, mobile app, development kit, etc. While at the beginning Km4City as you can see at FODD 2015 was only focussed on POI in Florence. Several new data and knowledge entities and tool have been added with Sii-mobility for automating the ingestion process (DIM, RIM) and making accessible those services and functionalities on the Smart City API. Sii-Mobility project is developing several other tools with the help of other partners and industries: vechicular kits, direction kits, partcipatory tools, ticketing tools, etc. Which presently are not developed yet and not included in the Km4City view, but will be totally compliant and interoperable with Km4City view. REPLICATE H2020 started in 1st of February 2016. It planned to use Km4City since the project proposal with the aim of exploiting the Km4City solution and imrpving it. The activity performed on REPLICATE is mainly focused on energy, mobility energy, IOT and Control Room. In that context, it is planned to add at the Km4City model IOT information (light, smart benches, smart light, smart waste, smart irrigators, etc. ), energy staff (house meters, energy meters from building, recharge stations, etc. ), and develop the smart city Control Room tools and panels integrating old and new data and information setting rules for control and sustainability. REPLICATE project is developing several other tools with the help of other partners and industries which are not developed yet and are not included into Km4City view, but will be totally compliant and interoperable with Km4City view. Other projects are joining the stream mainly exploiting the above produced results. They are all Open Source and share for everybody would like to use them in your projects and develoment activities, creating new instances of the platform in your premise of collaborating with us, providing us your data, etc. Examples of this fact are not for profit projects such as: GHOST MIUR project in the Cagliari area, NextPOSition on Tuscany with VAR Group and EPSON, JOIN project of Tuscany Region, UNIFI Mobility, etc. Twitter Vigilance Connection with Km4City: Twitter Vigilance platform started since the 2014 as an internal project of DISIT lab. After few months of its activity the collaboration with LAMMA and CNR IBIMET was activated in a not for profit collaborative track. The first activation of TV was in Aprile 2015 in collecting tweets and estimating metrics based on them. Since that period a number of experiments were activated in the areas of: weather, environment, drugs, services, advertising, city moods, etc. Most of the above mentioned projects planned to use the TV platform for different purposes: Sii-mobility for monitoring public transportation services (also contributing to improve the tools adding new features); RESOLUTE for monitoring as early warning tool and thus supporting TV in creating the RTTV version; REPLICATE just use it in some dashboard facitlity thus adapting TV in being dashboarded. Some other FAQ. Please provide yours to km4city@disit.org, or on facebook. Km4city provides a collection of models and tools for smart city developers and administrators. Service Map tool: http://servicemap.disit.org a tool for developers to pose geographic queries (learn and generate code queries in an esy manner) and see the knowledge base produced by the harvesting process that includes: "grafo strade" (street graph) from Tuscany region, open data from Florence Municipality, traffic monitoring, geo and weather information from LAMMA, traffic sensors. Some of them in real time. It accessed to an RDF Store based on Florence open data and on Tuscany region mobility data on the basis of Km4City model. 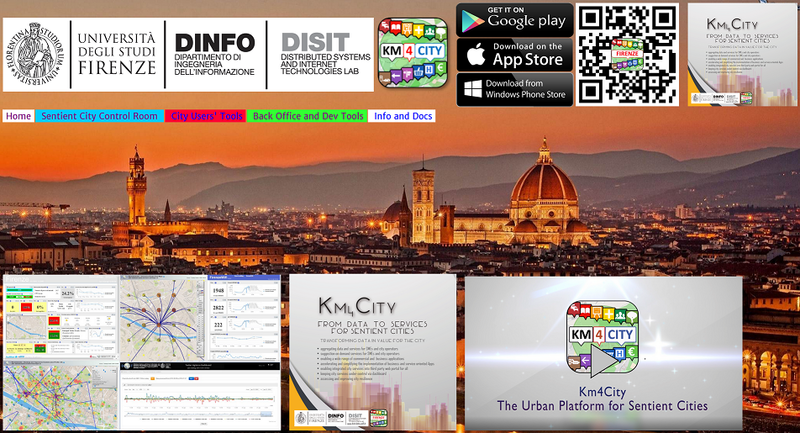 Data Sets included into the Km4City model as ServiceMap.disit.org, coverage all Tuscany for almost all structural data and main services. More details on Florence and Empoli for real time information in the Florence Metropolitan Area. Smart Decision System, decision support system for smart city based on System Thinking, connected to Km4City model. RIM: RDF Index Manager: user manual, for versioning of graph databases RDF stores. LOG.disit.org http://LOG.disit.org graph can be used to browse the knowledge model of Smart City, just an example of a Florence segment. http://log.disit.org/service/?graph=71de8caef449ed56143aa95c8c8266ab From that, you can see the whole DISIT knowledge knowledge model for Florence, based on Km4City ontology. MUGNONE2016, Civil Protection exercitation in Florence about esondation of Mugnone river, May 2016. (see Mugnone 2016 dashboard of Resolute Km4city experiment). Km4City Mobile Application, for Apple iOS, iPhone, iPad, etc. i-Cities, CINI workshop on ICT for Smart City and Communities, Palermo October 2015. DISIT is a Smart City Node of the CINI smart city national consortium.